Nothing tends to end a relationship quicker than one party getting caught cheating, but is it always their fault? Humans are among the three per cent of species which practice monogamy, and it is generally accepted as morally correct to stay faithful. So why do people cheat? In a video uploaded to YouTube, The School of Life have argued that infidelity may actually result from an imbalance between a desire for closeness, and a desire for distance. It makes sense. Not being on the same page as your partner is definitely not a recipe for success. 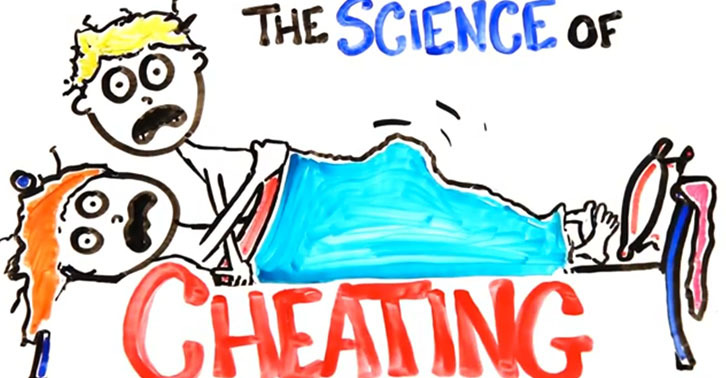 Thanks to AsapSCIENCE there is another, as you’d expect, more scientific reason why someone might have an affair. So, 50 per cent of test subjects who had the long allele for the ‘happy hormone’ Dopamine cheated, compared to only 22 per cent of those with the short allele. Those with the long allele also showed a greater tendency to take risks, and develop addictions. So beware the date who describes their personality as addictive. Levels of the hormone Vasopressin are also influential. The lower the level the more likely you are to cheat apparently. AsapSCIENCE claim in their video that studies have demonstrated increasing the levels of Vasopressin in polygamous animals increased the likelihood they’d become monogamous. Studies have also shown money is a key factor. Men who earn considerably more than their partner are reportedly more likely to cheat, but similar results were demonstrated by stay at home dads. Only when earning potential was similar between partners were the odds of cheating lowered.